It was a long baseball game Sunday. We actually paid to have it filmed, so we’ll get a DVD of the game at some point, which will be good. We were delayed to start, and it was hot, but we got off to a good start. We played well, and had the lead until the bottom of the last inning. I didn’t have a great game, but the team played well. I was at third almost the whole game, taking an inning off when another guy wanted to play there. For most of the game I didn’t see a ball at all, not touching a game ball except for throws to the pitcher and a toss down after one strikeout. At the plate I saw the first pitcher well, but topped a low ball for a hard grounder to second (out) and popped one high to first (out). The last time I was facing a new pitcher that mixed a lot of slow curves with some fast ones. I was looking curve and he never threw one. A good pitch inside that I let go, one outside that I didn’t reach, a ball, and then a high inside one that felt like a strike and I didn’t catch up to. 0-3, and didn’t get up again. We played against a couple former players from our team, and one is a big guy. 6-2, 240ish, he’s a lot bigger than me, and I definitely played behind the bag for him. He grounded twice to short, then ripped a low grounder between third and short that neither of us reached. Then he came up again. Bases loaded, I stepped back and he ripped a bouncing grounder to third. Glad I was back, and I stayed down since we were on turf and I worried about the ball sliding. I stayed down a little long and it bounced a little higher. I ended up catching it with my forearm, trapping it against my body. I grabbed it, ran towards third and tagged the runner coming from second. A good play, but I had the dusty imprint of the ball and stitches on my inner forearm. I talked with him later and he said I’d be thinking about him all week. He’s right as I keep bumping the forearm and it’s sore. No bruise to see, but definitely sore as he hit that ball hard. We led the game by 2-3 runs most of the time, but walked the bases loaded in the last inning and walked in a run. Then there was a grounder to short where we caught the runner at home. Then a hit that tied the game, and we were playing right. A grounder to me that I fielded and threw home for the out, but I was trying to be sure I made the catch and throw, and was slower than I could have been. No time to throw to first. Last guy rips one between third and short. We couldn’t reach it and a walk-off hit defeated us. Tough loss for some guys on the team, but we played well and it was fun. I woke up last night with intestinal cramps, and spent a few hours at different times in the bathroom, mostly in pain. I felt better this morning, but the cramps continued and around 9:30 or so I gave up on work and went to bed. Read and slept all day. Better now, but still some cramping. Not what I needed with vacation coming and lots of work to get done between now and when I go to the UK. Can't figure out what I ate that was bad. Other than a beer yesterday, I think Kendall and I had everything the same and she's doing well. I drove up to Golden this morning with Kendall to pick up Delaney. It was great to see him, after not having him around for 2 weeks. It made for a very quiet, and strange, house with both he and Kyle away. He was doing good, growing up, becoming a teenager, answering lots of questions with a drawn out "yeeee-aaahhh" and starting to display that "I'm cool, you're not" attitude. He had a great time, but was glad to come home and see us. It’s nice when something works as expected. Tia and I rented a pop-up for next week when we go camping. Our plan was to tow it with the Suburban and use her truck to tow the horse trailer. If all goes well, we are talking about just getting a pop-up for the 2-3 trips a year we will make. I got the rental agreement from the company last week and it called for a round 7 pin connector and 350lb tongue weight. The Suburban had those things, but we weren’t sure they worked since we’ve never towed with it. Today was the day I headed down to the trailer store to get things checked. I had visions of us needing to drop it off tomorrow and pray it would be done by Thursday. I walked in, the guy said he could check it, walked out with me and hooked up his tester. We ran through lights, brakes, and signals and everything was fine. Almost amazing that everything was working and there’s no repairs needed. Now we just need to plan a menu, do some shopping, and get things packed. I worked with an older lady tonight at karate, which was good. Slowed me down, let me work on technique, and also work on control without twisting my ankles. I pushed enough to sweat, but not enough to really get out of breath or hurt myself at all. Found a 1/4 bag of the pretzels in the pantry and added guac and they were excellent. We had a meeting last night with our financial advisors and it went well. Talking with them about Tia leaving her job and also about the current state of our investments made us feel confident we can make this work. We threw them for a bit of a loop after our last meeting last quarter with the idea that Tia would leave her job soon, but they are re-running numbers and will let us know soon how things look. The Tony Valentine series is great, and Wild Card looks back, going to the time when the first casino opens, Valentine is just a cop and his wife is alive. He begins to investigate the idea that the casino is being cheated for a million dollars a day and we find out how he became the expert cheat catcher that he is today. It’s a great look at the origins of this character, with all the integrity and honesty that he brings to the future series. I really enjoyed this look back at a character I’ve enjoyed. We learn how Valentine got into this business and some of why he was so successful. It’s partially him, but also a lot of bumbling from the rest of New Jersey, being unfamiliar with just how much money is spent gambling. I enjoyed James Swain’s Valentine series, and was thrilled to see this one. Jackpot continues the story, with one member of a gang left that Valentine swore to track down. In this one it feels like a quicker ride, almost like Swain was in a hurry. I don’t think it had the intrigue that the others had. It felt like you could predict some of the story whereas I was mystified most of the other books. In this one the swindle is interesting, and there are actually two, as a few characters bumble along each trying to win their own jackpot, but bumping into the others. Valentine is chasing one of the crooks down, a person that escaped him years ago, and is supposed to be dead, but isn’t. I would recommend reading the others first as this one seems to have more references and dependencies on them than the other books. Feeling good this morning, well, except my left eye. Something is still in there, bugging me so no contacts today. But the ankle, which was sore last night, felt much better this morning. I had a great lunch run, and the body feels good. My karate studio (5280 Martial Arts) bought a bunch of heavy bags a month or so ago, and they’ve been sitting at the end of the room. Until tonight. We broke them out tonight, working on two man drills, one of us on each side, taking turns hitting it. I was trying to take it easy, and a few times pushed it. I know because my ankle was sore afterwards, but it was fun to work at a higher pace than normal, and put some power into a few blows without worrying about hurting someone. Worked up a great sweat in 40 min and looking forward to doing some more in the next few months. A battle on a resort planet has the characters split up. While the rebuilt Framework characters expand, we see the difficulties of having a reborn Ayan and Jacob, we also have trouble with the Triton and the various groups that live aboard. Some want to leave, and take their chances against the Order of Eden. The book splits it’s time, letting us see Eve being reborn into a body, the Order of Eve, and Hampton manipulating the world towards some end. Apparently he has some knowledge from the Infinity Machine, reading into the future, but wants more, which was the reason for the attack on the resort planet. He also has another Framework of Wheeler that he unleashes on the Triton. This book sets up for an amazing book 7, though I wonder if the author will really be able to pull the storylines together. It seems there is so much unresolved, and so many different characters to bring together that I worry there wont’ be a great ending. The pace slows in this book, with more conflict and interaction between the characters. Fragments, more than the other books, needs you to read the previous ones to understand what is happening. Another free, or low cost book that caught my eye, so I grabbed Medical Error before a vacation. The book reminds me of Robin Cook, with a doctor having a patient die, apparently after an allergic reaction that shouldn’t have occurred. They checked records, and found a note, but the patient was a victim of identity theft, and the thief was the one that was treated. The doctor begins investigating, in a somewhat bumbling manner that makes the book believable. However the doctor also is a victim of identity theft, and must deal with her own financial issues at the same time. She begins to suspect they are related, which is where the book falls down a little. A few too many coincidences, and too much crossover between the doctor and patient that make the book seem a little forced. It was a good vacation read, but not a great storyline. I grabbed Fracture as soon as I was done with the previous book. This series hooked me. In this one we get more of the Regent Galactic plans, along with a battle at a remote mining station that the Triton visits. They manage to survive the battle, in which a rival corporation tries to collect the bounty on the Triton, but it’s a bitter battle. The book continues the exciting series, but I don’t think it stands along as I think you’ll lost trying to read this one without the background of Frontline and Triton. However it’s exciting, and it shows that the Triton isn’t invincible, getting caught in a few situations that you might expect they’d breeze through. I’ve read more than a few books by Swain, mostly the Tony Valentine series. This is somewhat a continuation of the Jack Carpenter books, but The Program has very little Carpenter in it. Instead we have the FBI agents he’s dealt with in the past taking over this book, mostly Ken Linderman. From previous books, Linderman is searching for his long lost daughter in Florida while handling other serial killers. A kid is kidnapped at the beginning of this one and the agent learning from Linderman thinks it’s a serial killer they’ve dubbed Mr. X. Linderman agrees and they start the search and a trap with a police website. At the same time they discover this serial killer is in contact with another one in prison, one that was convicted on a lessor charge and is about to get out of prison. The book keeps you interested, moving between the chance to find the kidnapped kid, the struggles of the younger agent (a woman) working with the local police, and Linderman’s down demons. When the killer in prison offers Linderman information on his daughter, it’s a tense moment. Linderman turns him down, but continues to search on his own. A brief appearance from Carpenter gives him an idea and helps him move forward. The characters are a little shallow, but the writing, the excitement, and the twisted mind of the killers keep the reader interested and excited along the way. I’d at least read the book before this one in the series, if not the other ones before you tackle this one. It will help set the stage for a few references, even though this one stands alone. This was at DevConnections in Orlando this spring. I took an hour out of the few days I was there for downtime, and sat by the pool, trying to relax. I read a little, but really tried to just sit there and organize my thoughts, relax, and let my mind start to wander. I don’t take enough downtime, but it’s valuable. Surprisingly, some of the best thinking time I’ve had has been while driving to and from the mountains to ski. Completely off topic from SQL Server, but cool nevertheless. 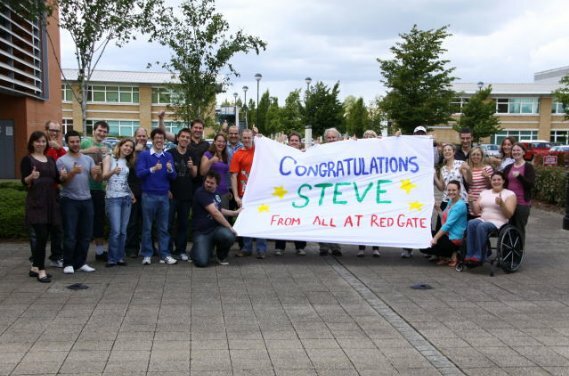 I have been using Skype to communicate with Red Gate on a regular basis for video calls every week. It’s been over a year, and I’ve always had to get my laptop ready for weekly calls. I often take them in another room when my wife has a call scheduled at the same time, and it’s a slight pain. It also means that I sometimes interrupt what I’m doing on the desktop when I have a call, which is annoying. I downloaded the Skype app on my iPhone awhile back, and I’ve used it for calls with family, but never for work. It didn’t buy my anything since I’d need to hold the iPhone up, which defeats some of the purpose as I can’t look something up on the call, which I often do as we refer to data, prototypes, or something else. I decided to search around and see if I could find some mount for the iPhone. I have one that lets me use it as a teleprompter, but it isn’t very portable. I ended up finding a snapmount for the iPhone. They make a bunch of other ones for various phones as well. It arrived recently and I hooked them together. I had a call with Andrew Clarke last week, and I decided to use Skype on my phone, rather than tracking down the laptop. It worked out pretty well, allowing me to see Andrew, and he to see me, as well as letting me still use the computer and send him a couple emails while we were chatting. Not the neatest desk, but it worked well. I paired this with my wired headphones from Body Glove, which worked well, but the cord is a little short. I like to lean back to talk when I don’t need to type, and this one is a little restricting. However it’s my favorite for traveling. however I’m really looking forward to next week when I’ll use my Gogroove bluetooth headset. That will be really cool. The baseball bus today went off the tracks. We had an early game, and I drove a couple other guys up there. We arrived a touch later than I wanted, and didn’t have any infield warm ups, just a little throwing and stretching. It started out hard, with the top of the inning having us give up 3 runs. I fielded a hard hit one at 3rd, rushed the throw, and pulled the guy towards home. He didn’t get the catch, worried about a collision with the runner. Then in the 4th, the wheels came off. Two hard hits to me, that I fielded, but then didn’t make good throws. One to the left (outfield) and one that was just short and bounced too close and the first baseman missed it. In both cases, I had time, fielding hard hit balls, but rushed things. I did make one other throw over there, so it wasn’t completely hopeless, and I fielded things well. I just kept rushing throws. At the plate we did better as a team. I hit third, coming up in the first with people on second and third. After a few fouls, where I was seeing the ball well, I caught one and ripped it to deep right center, to the fence, getting a double and driving a few in. My second at bat had me missing a few because almost getting crossed on a curve that would probably have dropped on the plate. I was swinging and caught it just enough to blooper into short right center for a single. My last at bat had a few fouls and then a strong swing at one up and away. The umpire was calling them outside, so I swung, trying to go with it. I did, but it popped out to short. Still I went with it and it went to the left side of the plate. The fourth inning, where I messed up two throws also had the rest of the team fall apart. A grounder going through the shortstop’s legs which might have ended the inning, an error at second, another bad throw from second, and a couple hits had us give up 6 or 7 runs. We never recovered, not getting many more hits or scoring more. It got everyone a little down after a good start. But no one got hurt, and we played better. Next week we have a game being video taped, which should be interesting. Hopefully I’ll play better and the team will do well. Starlet is looking much better, stuck in a stall, but much better. Lots of stitches, but this looks like she’ll recover fine. I walked the whole track, but can’t find a spot where I think she caught on something. Rain last night didn’t help as I can’t see blood anywhere either. A mystery. Once again, we had a late night vet visit. Starlet, our 4th horse, cut herself somehow yesterday in the storm. It was a bad cut, and we needed the vet. He didn’t arrive until after 10, and Kendall wanted to go see and help. She did, as you can see, holding the tail so the vet could clean the wound, apply Lidocaine and then start stitching. At that point. Kendall and I headed for bed, around 11:30. Fortunately it looks like the horse will be OK, although we need to manage infection and healing for a week or so until the wound closes up. From TED, worth watching. The message is more powerful than the story. Trust yourself and try. The right knee has been sore for months. Not terribly sore, but it doesn't support weight well when I get it bent more than 90 degrees, and it's sore if I kneel on it. However I woke up today and the left knee was a little sore. Not hurting, but sore, down around the knee cap. I might have knocked it, though I think I just need some straps on it for a week or two. I went shorter today on the run, not slower, but less running than I was thinking of to not push things. I saw a video on this page about using the Kinect in video conference calls, which I like, especially for those calls where you need to talk about actual objects. As industries outside of software make more use of video calls to talk about things, this makes sense. That’s the way I think we should be thinking more about life. Our world outside of work is more important. It might not be more of our time, but it’s more important, and we recognize the value of living a life outside of work. Or maybe doing the work that meshes better with your life. We’re trying to do that at the ranch with Tia and are making plans to get her more into horses at some point. We know life is short, and we have to keep that in mind as we move through each day. We need to work, we have commitments, we need a purpose in a career, but it should be in balance with our families, our hobbies, and the things we love in life. A survey from Microsoft shows quite a bit of success behind an Internet phone scam. The same type of thing could some through email, and it shows why you should not be responding, clicking, or believing anything you do not know the source of. It's been a busy few weeks with something going on almost constantly. I didn't sleep well the last few days and was exhausted this morning. After struggling through most of the day, I paid the maid around 3 and took a nap. I walk the track that you see here, usually with the dogs for company (occasionally a cat) about 1,000 feet to a couple feed buckets and spread a hay bale among them. The horses kick and annoy each other a bit, but I don’t usually wait until they figure it out. Either they’ll all eat, or we’ll have less horses to feed. Somehow it seems that much of the time I end up feeding I find a fairly empty water trough. It’s not a big deal to clean it with a brush and then fill it, but it takes time. Fortunately I’ve learned to plan on doing this and build time into the schedule. If I don’t, it’s a good day, but if I do, I can check email on the iPhone while listening to Pandora. That cats usually come out to see what I’m doing, and will look in the trough, but none of them has decided to take a plunge yet. I’m still hoping they’ll jump in one of these days. Chores done, we head back to the house. In the summer it’s hot, and the dark dog is panting up a storm. In the winter, we both move a little quicker. Two weeks in a row! 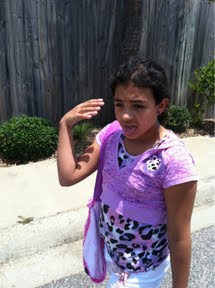 Tia wanted to run with me, so I didn't go at lunch and waited until 3 when she was free. We convinced Kendall to get on her bike and come with us, so we had a nice, long, 40 minute run today. The route was my normal one, but extended down the hill I usually avoid. It's not overly steep, but it's challenging and I usually don't want to tackle it. Check out the elevation here, it's definitely challenging. A good way to do my run today, my two girls keeping me company. Last night I cut grass for a couple hours on the tractor after I got home. Tia and Kendall were out enjoying girl’s afternoon, so I decided to get some work done. Just a little breeze was blowing, and my allergies acted up a bit. I took Benedryl, and cleaned up as the girls got home. Tia wanted to ride a bit as the sun went down, and Kendall wanted me to play with her and hew new bouncy ball a bit. I was tired, but I did, bouncing the ball in the driveway a bit. Then we went up to watch a little TV together. As it got dark, I wanted to spend a little time with my wife. So I grabbed a plastic wineglass, a bottle of Klinker Brick, and walked out to the barn to talk with Tia as she finished chores. We shared a little wine, while cleaning litter boxes in the barn, putting out some hay, and finishing graining the horses. Well, Tia did that while I watched and chatted with her. Not the way most couples end a day, but that’s life on the ranch, and it’s great. We had a long, slow game at baseball yesterday. It was hot to start, our pitcher struggled, and we had a few errors. Add in there that a few good hits from the other team, and things were looking bleak. When we swtiched pitchers, things got a little better, but not a lot and the game ended early, 6 innings, with the mercy rule having us down by 16 runs. I had a better game, personally. I started at 3rd, where I picked up a hot grounder, and then was in a hurry at the end of a long inning and threw it too quick, not getting set and it was short, and not picked up by the first baseman. I also chased a short one by the pitching mound and was there, but couldn't get it off the ground. Right when I got there, it stopped bouncing and at full speed I couldn't reach it on the ground. But I had good range. I missed a liner that sizzled through the air just above my head. Not sure I could have reached it, but I didn't react quick enough in any case. That was the extent of my third base efforts. All one inning, though I played 2 there. I switched out at second with another guy since we were platooning. Three of us carrying 2nd and third, with me getting to move back and forth and not sitting. No balls hit my way at second, but I did pick up a late throw on a steal. No play to be made, but I fielded it and got there, which I haven't done in a long time. The last two innings I took first base. The guy we normally have there has a sore knee, and wanted a break, so I jumped in and took a few throws. No major plays, but I caught the throws over there, got stretched for one and made the catch, but pulled off the bag. Not sure I could have gotten the ball without pulling my foot. I also managed to grab a bad pick off throw way to my right, above the sliding runner. Almost didn't get to that one. At the plate things were better. I tried to beg off batting, since my practice one day this week was so so. I saw the whiffle balls at home OK, even took a couple to the opposite field, but it didn't feel great. However the manager said I should try, so I did. First at bat I saw the ball well, one a hard throwing pitcher with a nice curve. The first one was outside, breaking in, but wide. It was close and I couldn't have argued a strike, but it was a ball. I saw two inside balls, both way inside and one making me jump back. Then a fast ball down the middle that was a little high, and I couldn't catch up. I had switched to the 32" bat, so that had me a little nervous, but I was thinking another fast ball and get set to start swinging early. It was high and outside, and I walked. The next at-bat was better. I fouled one off, then a couple balls before I topped one that was belt high, inside and it rolled to the first baseman. 0-1, BB, and I came up in the 6th, the last batter (potentially) of the game with 2 outs. The first two guys had struck out, so I had no pressure. 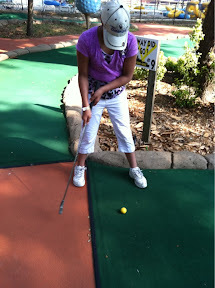 I went in ready to swing and got a low fast ball. Hard swing, hard pitch, fouled back and the catcher said he smelled burning wood. Another pitch, another swing, same result, and this time the catcher said he wasn't kidding, wood was burning. A ball and then another strike, belt high, outside. I saw it, swung, and caught it in front of the plate, near the end of the bat, and it blooped to center. A single, pinch runner, and the game ended on the next guy. 1-1, BB, not bad, but the good thing was I saw the ball. Didn't turn the head and saw the ball hitting the bat. Felt better, and the back was fine. I think it's time to start getting to the cage or the pitching machine twice a week and see if I can improve my batting. Last night was a lazy night, no one really sure what to do, so we knocked out an errand that we've been needing to do. We went to get Delaney a new bed. With the move to set up a spare room, and a guest coming next weekend, we decided to get a spare bed. However we've never bought the little kids furniture. Kyle got a bunk bed set that's since been handed down to both kids, and they each have one bunk now. Kendall said she wanted the bunks back, so we decided to get Delaney a new bed. American Furniture Warehouse, our first stop for furniture was on the list last night and we wandered around, looking at difference beds and mattresses. Delaney was a bit obsessed with memory foam, so I think advertising is alive and well in the US. We tried a lot, and ended up deciding to get him a regular mattress with foam on it, and then a frame bed. He doesn't care much about the headboard, with none of the captain's beds interesting him, so we decided to save a little $$ and ended up grabbing a full size mattress and frame as well for the spare room. It won't be here until Tues, so Delaney will miss out on the new bed for two weeks, but we'll get Kendall her bunks and have a spare room set up nicely for our guest next weekend. I’m glad we got to the end of the week. Even though life is a little more relaxed with the kids out of school, me being gone Monday, plus something scheduled on Tue/Wed/Thur nights made it feel a little busy and stressful. Last night Tia knocked off work and just lay in bed. I went to karate since I had to get Kendall from day camp, but I was certainly ready to come lie in bed and relax afterwards. Tonight should be quiet, but then the weekend gets busy as we prep Delaney for his time in camp and try to knock out some chores. It’s been an interesting journey running every day for 1,000 days. I never thought I’d get this far, even after running for a whole year. One thousand is a big number. Some interesting things I remember along the way. I started on Sept 10, 2008. My inspiration came from Jim Garrett, on the Hard Knocks TV show. I’ve run with every member of my immediate family along the way. My middle son, Delaney, has been with me for the most runs, probably 40-50 of them. My most memorable run was with Delaney, when it started raining on us. I have run in Colorado, Washington, Florida, North Carolina, Virginia, Maryland, Louisiana, Texas, Nevada, the UK, St Marteen, the Bahamas, New York, Ohio, and probably a few other places along the way. My hottest run was at 2:00pm in Las Vegas last summer, when it was 110. 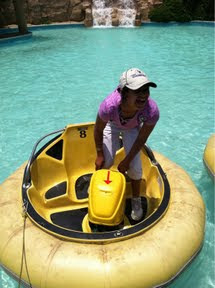 The most humid was probably in Baton Rouge, cruising around University Lake (which I thoroughly enjoyed). The coldest was at Copper Mountain, just after Thanksgiving when it was about 7F outside. I’ve run in a snowstorm (Breckenridge), the rain (above), and in lots of wind. I prefer the hot days. I watched 7 seasons of Star Trek: The Next Generation, one season of Battlestar Galatica, one season of Heroes, two seasons of Dexter, and numerous movies while on the treadmill. My latest run was about 11:00 one night, after a busy, busy day. My earliest run was 4:30 am, hitting the treadmill in a hotel at Heathrow airport before starting my journey back to the US. My hardest run was Thanksgiving 2009, day 443, after we’d skied all day, then had Thanksgiving dinner at Wendy’s, checked into a hotel with no treadmill, and I had to get out in the cold, tired, about 15-20F, and run through the streets of Frisco. A hard one for sure. On quite a few days that I’ve run, I’ve also had karate class, played baseball in my adult league, snowboarded, or played tennis with the kids. I’ve run with a pulled hamstrings, slightly sprained ankles, sore knees, and very tired legs. I’ve been surprised that after a few weeks of running, most injuries seem to heal up. The day I was almost sure I’d end this streak was Jan 3, 2010, day 481, where I stupidly went off a jump at Breckenridge, caught an edge on my snowboard when I landed and my right knee hit the ground. Hard. I barely made it down and that ended my day. Ice, a couple beers, and 4 or 5 hours later I managed to get on the treadmill, determined to give it 4 or 5 minutes. I wasn’t going to push it, but I managed a little over a mile, albeit slow (about 4.5mph). There are some other memorable ones, like the broken treadmill in Breck that had me running in a sweatshirt and knit hat as a snowstorm started because I didn’t have other clothes, or my daily runs down Tottenham Court Rd in London while I stayed there. My time on the beach in my native Virginia Beach, and a group run after SQL Saturday #60 in Cleveland. It’s been run, and I look forward to many more runs in the future. I woke up to this very cool photo from my employer. I was checking my Twitter feed, and noticed quite a few #runwithsteve hash tags, from various people already knocking out mileage for the goal of 1,000 miles today. The tally survey is here: Running With Steve. I am looking forward to getting out there in a bit with my wife, maybe a kid if I can convince them. I hope to do five today. It’s been quite a journey to get to 1,000 days. I was inspired in Sept 2008 and was thinking to get to one year and then see. When I got to 366, I did a Forest Gump. 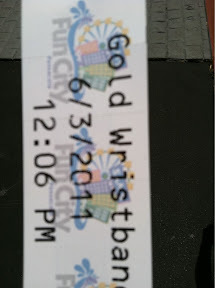 I kept going since it was fairly easy. I made it to two years, and then started thinking 1,000 days, and made it today. I’ll run this afternoon, when my wife has some time, and enjoy day 1,000. The act of doing something every day has been amazing for me. It’s not so much the physical benefits, which seemed to peak after about 4-6 months, but more the mental benefits. I know I’ve accomplished something every day, and it inspires me. It becomes a habit that helps me manage the rest of my life, keeping perspective, thinking long term, and balancing out the various things in my life. Where do I go from here? I’ll run tomorrow, day 1,001, and see what happens after that. I read an actual book. I physical book for this one. 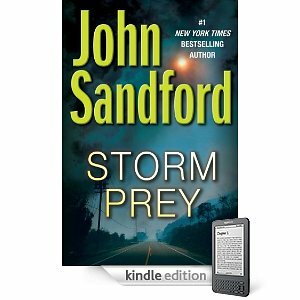 I grabbed Storm Prey while on vacation, knowing that I’d have to kill my Kindle for the take off/landing of the plane on the way back home. I have loved the Lucas Davenport series, and after this one, I’m reminded of how exciting and well written they are. It makes me want to re-read more of them. In this one Lucas is getting older, but he’s still the rough, tough, difficult cop we know from the past. Weather is the focus of this one, catching a glimpse of a robbers one morning in a hospital. She’s in early for a co-joined twin separation and the robbers have knocked over the pharmacy and kicked one of the workers too hard. She almost collides with them and sees the passenger. As expected, things go out of control. The robbers panic a bit, and the two brothers involved decide to kill two of the other robbers to protect themselves. They bring in a kid, another killer to remove them, and then the witness as well. When the guy fails to kill Weather on the road, and she almost kills him, the book speeds up. We have Lucas starting to shake the bushes and investigate, while also protecting Weather. The relationships between the robbers deteriorate and no one knows the whole story. Except the reader. Throughout the book, Sandford keeps us informed. We see Lucas and his crew, Weather’s life in the hospital, and the various interactions of the criminals. We know what’s going on, and you sometimes want to scream at the characters for their decisions and actions. But it’s exciting, and the pace builds until the end where we get a nice wrap up after everyone is dead. The last few pages actually had my smiling. I grabbed Spyware because it sounded good. Computers, viruses, thrilling action, what more could a geek want. It’s a thrilled for sure, with a computer science professor, who teaches about operating systems and viruses, being called out of class because of a virus that’s sweeping through UC - Davis. As he responds, and worries this code might get loose on the Internet, he shuts down the system, to the dismay of his supervisor who was told to do nothing by the FBI. They arrive and he’s the number one suspect because of his background. He released a virus when he was in school, and he’s worried. However life changes quickly. His son ends up at home alone, surprising an intruder that we suspect is planting evidence. The boy is kidnapped and life changes. The professor gets home to comfort his wife, but when the FBI arrive later, he suspects they’ll arrest him and not look for his kid. So he goes on the run. The book has a few twists, but it’s not terribly complicated, and many people will predict what happens. The author does a good job pacing the writing, building some excitement and driving the story towards a climax, but the characters are a little shallow and it’s not an amazing book. I wouldn’t read it again, but I did enjoy it as a vacation read. This is pretty cool. Running with Steve. Tomorrow is Day 1000 for me, 1000 days in a row, running at least a mile every day. A friend decided to try and motivate other people and set up a challenge, trying to get people to knock out 1000 miles, running, cycling, whatever, in celebration. If you want to participate, add your mileage in. I keep a blog of my journey at The Daily Runner. It’s got entries for every day along with various thoughts on the streak of running. My inspiration post should explain why I started. It chronicles the journey, which has been fun. Thanks to Jes for setting this up, and it makes it a much more special day, no matter how many miles get logged. How will I celebrate? With a run, of course. I’m aiming for 5 miles. We were talking about the zoo, so I got up early and did a nice long run, pushing 2.5 mi. Not long for many people, but long for me, someone that typically is in the 1.75-2.0mi range. I’m averaging almost 2 for the year, and I’m trying to keep it up. Kendall slept in, waking up after I got back and saying that she wanted to just relax and not hit the zoo. I think we’re both tired from the weekend and mildly sunburned, and a quiet morning at the hotel is fine with me. Lay around, swim a bit, and then pack up and head out this afternoon sounds like a good plan. It’s been a fun vacation, and I mentioned bringing the whole family next year. Kendall said that would be OK, but she really was glad it was just us on this trip, and we had some good daddy daughter time. 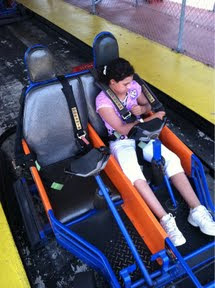 It’s neat to see her enjoying these trips, and I think these are some of the best gifts we can give out kids. Getting them alone with us to enjoy some time away from the family in a new location. I’ve had a few trips to different places with kids, but need to plan more in the future. No pictures since I left my phone in the car, but today was beach day for Kendall and me. We talked about getting up early, but ended up being a little lazy and not heading down to Pensacola Beach until about 10. Apparently most other people were lazy as well as we easily found parking near the west end of the beach and wandered over to the water. 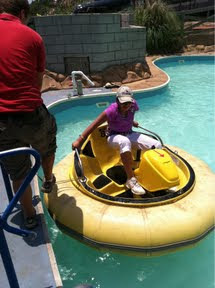 We splashed and played, with Kendall having a good time. She got dunked a few times pretty well and wasn’t happy with salt water in her throat, but we survived. A cherry snowcone halfway through the day helped. We also got a boogie board, which was hard for Kendall to ride at first, but she got the hang of it and had a good time. Around 2 we were getting hungry, and a little tired, so we packed up and called it a day. I sprayed us pretty good with sunscreen, but I think we have a mild sunburn in a few places. We’ll see. Now time to relax, get clean, and then dinner and a movie with my little girl. 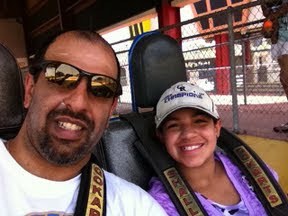 This is a fun Daddy/daughter trip. I got up early to run this morning, on the advice of Kendall. She remembered me talking about running before a few bad plane trips, so she told me yesterday I should get up and run before we go to the airport. So I did and now it's time to wake her up, get things in the car and head off. It's going to be a weird few days, and I almost wish I'd extended another day, but this is already a lot of travel. Pensacola this evening, likely a beach day with Kendall tomorrow, and then I have a speaker's dinner tomorrow night and 3 presentations at SQL Saturday #77. I'll bail in early evening and then Kendall and I have Sat night, Sunday, and Monday most of the day to hang out, relax, and have some fun in Pensacola. Once again, I grabbed this as soon as I finished Triton. Frontline continues the story, but expands it. The virus is loose, wrecking havoc on the universe. We start to see some of the inner workings of Regent Galactic and their plans to take over the galaxy after the fall of man. They are portrayed as the evil company, and in fact, an evil leader at the top. We also find out that they developed the Framework technology and have used it to build a few more clones. Meanwhile the Triton begins to grow. There are troubles as they try to recruit people and work together, but also saddened with the loss of the real Valent. In this one we find that his wife, who died in his arms, has a twin, another clone grown in a time warped wormhole, allowing accelerated growth. She begins her journey to reunite with the Triton and her old friends. We learn that Ming, from the first book, is also alive and accompanying her. Valent’s daughter also becomes a part of the ship in this one, earning the respect of people and assuming the first officer duties. The book feels like a continuation of the previous books, not a new book, and the series remains exciting. As soon as I finished this one, I was looking for the next set of adventures in the next book. 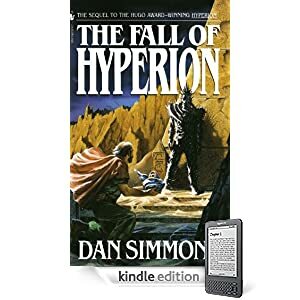 The next book in the Hyperion series picking up where Hyperion left off. The pilgrims are nearly to the Time Tombs, and in the Fall of Hyperion, we get the chance to have the story conclude. The story is different here. Rather than the stories of each pilgrim, this book alternates between the adventures of the various pilgrims once they arrive at the Time Tombs, and begin to confront the Shrike in different ways. It also includes a look at another cybrid of Keats, this one in contact with the senior leadership of the Hegemony, reporting back on the pilgrims progress, which he dreams. It’s not as fascinating as the first book, and in places the story feels a little forced, but Simmons does an amazing job of pacing this book, building suspense, switching perspectives at good times, and increasing the excitement as you get to the end. I may not love the way the story unfolds, but they way it’s told is excellent. If you enjoyed Hyperion, I think you’ll like this one. 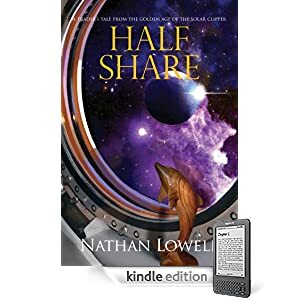 I read Quarter Share and Half Share earlier this year and have been hoping to get Full Share as soon as it was out. I checked the other day, saw it, and bought it while laying in bed over the weekend. The story changes a bit here. Where the first two books went slowly, moving almost through each day of Ismael Wang’s life, this one skips a bit. His studies continue and Wang manages to earn his full rating in all four areas that an enlisted ship member can. He does so well that he gets prodded to consider the Port Newmar academy, where he can become an officer. Trading continues, but the first real test for Wang comes when he’s informed that a new engineer is being placed on the ship at the next port. It’s a more experienced person, so he’s without a spot and could get left at the port. People ask him to bump someone else that’s lower rated, but he refuses, unwilling to push his problems onto someone else. 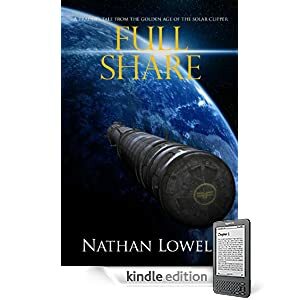 A crisis gives him the chance to shine, digging into the mystery of an EMP that caused the ship to lower power, and almost crash. He manages a temporary position as a systems mate on the bridge, moving out of engineering and up in the world. As we expect, he continues to show good judgment, works hard, and succeeds. His temporary assignment ends at the end, but with his acceptance into the academy, it’s moot. This book goes through time quicker, with more thoughts in Ismael’s head, and with the expectation that we understand how this world works. There are less details on trading and the deals, and more on character development, including the chance to meet more of Pip’s family in this one. An enjoyable book, and once again, I’m hoping the next book comes out soon. I realized that I hadn’t added this one, so here it is. I loved Quarter Share so much that I bought Half Share as soon as I was done. When I finished this one, I was disappointed there wasn’t another one ready. The story continues in Half Share as the crew of the Lois McKendrick sails the Deep Dark. Ismael moves up in this one, going to the engineering world of sludge where the air and water are managed for the ship. His studies continue as he gets his first ranking in all four disciplines and starts on the second ranking. He also grows up as a man and the story gets more adult. He begins to come into his own, driving the women of the ship a little crazy with his dress and manned as he gains self confidence after a visit to an exclusive tailor. It’s a boost that manages to also land him a short time with an officer from another ship at one of their port stops. The cooperative gets going, and many people in the ship join in, bringing in more credits from their private trading than they get in salary from the voyages. Ismael and Pip even manage to begin trading some ship’s stores that reduce the cost of the food for the voyage and get better fare for the crew. Mr. Wang grows, and the story is a great blend of a young man starting to gain some confidence, coming into his own, but not in every way. He’s still nervous and worried in some situations, unsure of how to act, but his instincts take over and he does well. A great continuation of the saga and I look forward to the next one. I ran this afternoon for Day 993, putting me one week away from 1,000 days in a row. A friend posted this blog (Running with Steve) and then at karate tonight, I mentioned the milestone to my teacher. He’s been interested along the way, noting 500 days to the class last year. He called it out today as an example of perseverance and consistency. Pretty cool and I’m fairly excited to get there. Actually it ought to be nice for Kendall and me, but overall, it’s chaotic at the ranch. First, I take Tia to the airport tonight. She flies to Dallas for work for a couple days and we didn’t want to leave a car there if we don’t need to. Why? Well I am going to Pensacola tomorrow morning with Kendall and while my company would pay for the car, we’d have two cars there and that’s a problem. So I’ll swing by and pick up Kyle on my way to the airport, where he’ll take the car back to the ranch once we’re on our journey. Why? Delaney will be here, and while he’s probably OK, we don’t want to leave him alone for that long, and he has his Scout Order of the Arrow meeting tomorrow night. Kyle agreed to stay here with Delaney and take him to his meeting. Friday Tia comes back and Kyle will pick her up from the airport and will get dropped off back as his apartment to work all weekend. Tia and Delaney get to have their own weekend fun and they’ll come pick up Kendall and me on Monday night when we get back. Seems a little crazy, but that’s our world.